This video shows how the villagers of Pilpichaca get out of extreme poverty. A video which explains the principles of the Pachamama Raymi methodology. More than 4000 meters above sea level. The project works with 6 communities, a total of 327 families, in the Pilpichaca district, province of Huaytará, Huancavelica region. This video shows the ambitions and efforts made by the participants in the Pachamama Raymi contest. This is the short version (7 minutes). This video shows the ambitions and efforts made by the participants in the Pachamama Raymi contest. A demonstration of the achievements of the participants after six months of a Pachamama Raymi contest. A video about the first awarding of prizes in the district of Challabamba. A recount of the exchange between various participating communities (Challabamba). Participating farmers from the district of Challabamba visit farmers from Paccarectambo. Seven months, seven communities in post-disaster Sacred Valley. Participants from seven communities learn from each other in a study tour (Sacred Valley, Cusco). Sponsors: Chamber of Commerce Cusco, Interbank and Casa Andina. AYUPER (Help to Peru) has the objective of sustainable recuperation of the crucial infrastructure and the daily life of families affected by the earthquake of August 2007. AYUPER: Aid to Peru post-disaster. One year of economic and social reconstruction after the earthquake of august 2007. One and a half year of farmers´ contests in the districts of Checca and Kunturkanki. Pasture in the Andes of Peru at an altitude of over 4000 meters. The Pachamachay community (Cusco, Peru) organizes itself to recuperate its native crops. Santusa Condori Huaman and Cicilio Cuchicari Chillihuari from the Tayancani community (Ccarhuayo, Quispicanchi, Cusco) have won the first prize in the national Pachamama Raymi contest. In this video they teach us about their work, with the aim of incentivizing other families. Jacinta Jose Cayllahua and Patricio Taype Ponce, from the Nueva Jerusalen community (Pilpichaca, Huaytara, Huancavelica) have won the second prize in the national Pachamama Raymi contest. In this video they teach us about their work, with the aim of incentivizing other families. SInforosa Juares Siccos and Gregorio Qorimanya Echarre from the Queyupay community (Lares, Calca, Cusco) have won the third prize in the national Pachamama Raymi contest. In this video they teach us about their work, with the aim of incentivizing other families. The Huayllani's family ranks first in the 6353 families who participated in the competition inter departmental Pachamama Raymi. Strong points: agro-forestry and house improving. Out of the 6353 families which participated in the inter-departmental Pachamama Raymi contest, the Suni family ended in second place. Their work stood out because of: the improvement of their living environment and management of water. Out of 93 communities, Jullicunca won the first prize in the inter-departmental Pachamama Raymi contest. Their work stood out because of: the forestry, the management of the pastures and the organization of the community. Out of 93 communities, Pumathalla won the second prize in the inter-departmental Pachamama Raymi contest. Their work stood out because of: the forestry, the management of water and the organization of the community. What did the winners of the RPP prize do with it? 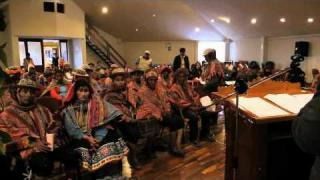 In 2011 Pachamama Raymi RPP and the villagers of Ocongate won the Integration and Solidarity prize from RPP. We will see Mrs. Isabel Huaman Pasqi from Upis, one of two persons who each received 10,000 soles (US$ 3700) for their community. The reportage made by the RPP radio when Pachamama Raymi won the RPP Integration prize. Pachamama Raymi, candidate of the Integration prize 2010, in the category Institution. Report made by the RPP radio. In this video, Javier Huillca from the Pinchimuro community in the district of Ocongate (Quispicanchi, Peru) teaches us about the practice of growing trout. In this video, Cecilio chegaray, Santusa Condori and Yolanda Quispe from the district of Carhuayo (Quispicanchi, Peru) teach us about the practice of growing guinea pigs. This video from the Ministry of Environment in Peru (MINAM) demonstrates the Pachamama Raymi methodology and some results in the districts of Ccarhuayo and Ocongate in Cusco. A group of French tourists visit Peru and the district of Ccarhuayo, where Pachamama Raymi has worked for two years. In August 2011, in the presence of the director, the prizes from the inter-departmental Pachamama Raymi contest were awarded. 6,353 families and 93 communities participated in this process.